Can African Grey Parrots See in the Dark? Many pet owners have shared their lives with a nocturnal pet, one who sees in the dark far better than when daylight is upon them. These nighttime busybodies fill the twilight hours with activities most humans don't see. Many birds are known for their nocturnal habits, but your African grey isn't a purveyor of night life. African grey parrots are known as diurnal birds, those who are most active during daytime hours. An African grey's night vision is about as good as a human's is, but his daytime vision is far better than yours, says Dr. James Harris, former medical director of the International Bird Rescue Research Center in Berkeley, on the Parrot Chronicles website. Birds, in general, see far better than humans, and it is said that the eagle, for instance, can spot a tiny field mouse nearly a half mile away. Despite being as bumbling in the dark as its human counterpart, an African grey is far more visually capable than people are. African grey parrots see color, and they do so far better than a human. If not for their intellectual level, which normally doesn't exceed that of a human 5-year-old, and their emotional level, which is that of a toddler, the African grey might be the best personal shopper available, with a heightened detection of color aiding in the selection of the right tie, or perfect scarf. The anatomy of the eye determines how each species sees color, and although this anatomy is similar for many species, the exact makeup varies. Composed of rods that allow for the detection of shapes, and cones that detect color, the eye of the parrot differs in that a fourth cone is present. This fourth cone allows the African grey to see in the ultraviolet spectrum. Fully armed with the cones necessary to detect color and the ability to see in the ultraviolet spectrum, the African grey has a heightened ability to identify its own species. In terms of survival, this is essential, as the birds flock together for added protection from predators. Equally as important is their ability to detect a mate. Ultraviolet light may reflect differently from the unique colors of a suitable mate, thereby assisting in the propagating of the African grey species. As a diurnal bird, the African grey will likely spend the night hours safe in her cage, but curiosity may get the best of her, and she may venture out if allowed. On the Parrot Chronicles website, Dr. Harris suggests covering any open light bulbs which may attract a night-vision-impaired parrot, thus avoiding the possibility of a burn injury if she tries to perch upon the bulb. Accidents happen, but in general, your parrot pal shouldn't be poking around at night, because she just doesn't see that well. Many nocturnal species of birds find their ultimate playground in the night hours, but your African grey is far better suited to spend this time in contented slumber. 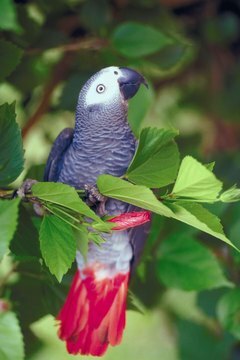 The World of African Greys: Do Parrots See Color?